It’s been looking very savoury up in this joint the past few weeks so I think I need to rectify that. I am definitely a lover of sweets (I will not have you perusing the last few posts on this blog and thinking I’m not), but sadly I’m not blessed with those genes that means I can eat all the sweets and not put on all the weight. To those of you who do have those genes, I shake my fist at thee and curse loudly. Other than the base a cheesecake is gluten free, so with a wheat intolerant colleague who is constantly uttering “I’ll just eat the filling” at birthday cake celebrations (while trying not to show her disappointment), I started thinking that if you made a crispy salted popcorn base, you could pimp up a cheesecake into some thing awesome AND cater for our gluten free friends. So, I busted out my 10cm spring forms pans and created this Nutella Cheesecake with Salted Popcorn Crust recipe which yields three baby cakes. You can use a large spring form pan instead to make just one but why have one when you can have three (to hear me wax lyrical about the virtues of multiple baby cakes read this). The salted popcorn crust brings a welcome salty tang which offsets the filling – a combination of Nutella, cream cheese and mascarpone. Topped with a flourish of Nutella and chopped nuts, they are impressive looking cheesecakes with a great taste to boot… and oh so easy to make! To make the popcorn crust, place popcorn in bowl of food processor a cup at a time and process until finely ground. In a medium bowl, mix ground popcorn, 1/4 cup sugar, sea salt and butter until combined. Divide mixture into thirds and then press mixture firmly onto bottom of three 10cm spring-form tins. Transfer to the oven and bake for 8 to 10 minutes or until lightly golden. Remove from oven and set aside to cool completely. While cooling, mix cream cheese, mascarpone and Nutella in a medium bowl with an electric mixer until well blended. Spread evenly over the popcorn crust in the tins and refrigerate for at least 2 hours or until ready to serve. To serve, first run a knife between the cake and the edge of the tin, then open the spring form lever and carefully remove the cheesecake. Top each cake with a teaspoon of Nutella and some crushed nuts. Oh wow this looks magnificent. I am a lover of popcorn too. Will be bookmarking this. Recent Post: 20 Weeks Pregnant! Why or why can you not live over here hunny? I would be a veeeeeery grateful friend ! I too have an insane uncontrollable popcorn addiction. I have never used it as a flour or biscuity base though. Such a creative lass you are! oh em geeeeee that looks fricken amaaaazing! Saw this on Food Gawker and just had to leave you a comment. Your photos are just lovely and the idea of a popcorn crust is quite genius. I want to make this very soon! Oh my gosh, this looks too perfect. I am drooling over here! We’ve gone almost exclusively to nut crusts (walnut is our go-to) for things like cheesecake –just don’t like the traditional crusts. They subtract rather than add IMO. Have not done a popcorn crust, though. We will. 😉 Really good stuff — thanks. Just a quick question! Could this recipe be used to make one large dessert instead of 3 smaller ones? I’m just thinking of putting it in a traditional springform cheesecake pan and want to see if that would work before I experiment! Hi Rebecca, Absolutely! Just use a large spring form pan instead of 3. The quantities will be the same. can i have oen of these for my birthday pls? Oh yes please! Having been waiting for you to post this recipe since you started thinking about it. Question! I’m thinking of making this tonight..is the popcorn meant to be “popped” before processing it in the food processor or are we to use the uncooked popcorn seeds and ground the? Hi Keisha, definitely needs to be popped!! This looks amazing! How long will it keep? If I make it Thursday night will it still be ok for Saturday night? Thanks. Hi Sam, as long as all the ingredients are fresh when you make it, you won’t have a problem with it keeping that long. Made this last night in the one large cheesecake variety. Served at dinner club for ten guests. 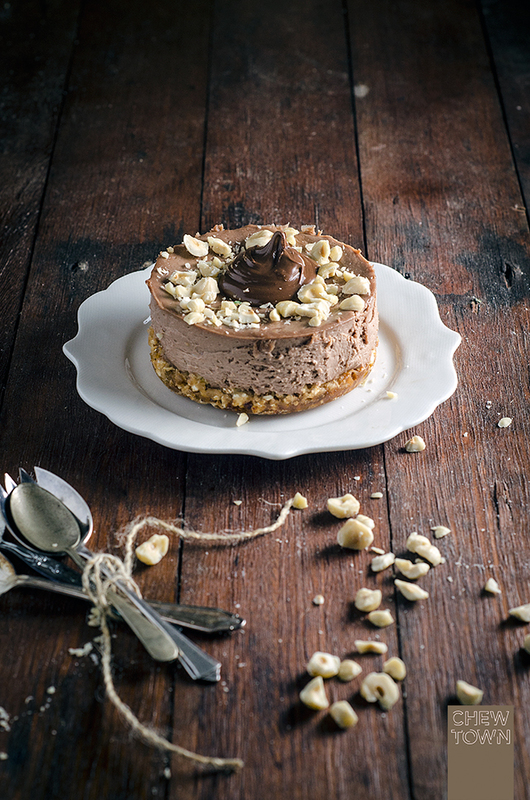 Put ten dollops of nutella around cheesecake to mark pieces, then covered in crushed roasted hazelnuts. DIVINE!! Popcorn crust is genius. Will definitely make this again. Is it 3 cups of already popped popcorn or 3 cups of kernels to be popped? Hi Kylie, it’s already popped popcorn. I am confused. Your recipe says to finely ground the popped popcorn, however your photos show whole popcorn?!?! Hi Amy, the popcorn in the base of the cheesecakes for all of these pictures are blitzed in the food processor and are not whole. They resemble a coarse breadcrumb when ground. Not sure what you are seeing as whole popcorn? Could it be the hazelnuts? Made this last night and it was a massive hit! topped it with raspberry ripple ice cream..people went crazy for it..thankyou for posting an amazing recipe! What do you think, can I use popcorn crust also while doing a baked cheesecake also? It has to be in the oven for a longer time. Salted popcorn crust?! Girl, you have changed my life!!! This looks absolutely amazing. Questions about the popcorn: Did you use hull-less? And do you think that would make a difference? Also, how did the popcorn not get chewy with baking? I didn’t use hull-less. The popcorn base when baked is crispy rather than chewy.